It's a year that many have prophesized will bring a catastrophic end to life as we know it. Whatever is in store a massive cosmic collision, a global environmental disaster, an Armageddon-like religious showdown, or a more subtle transformation many believe that 2012 will mark a major shift in the history of our planet. But what is there to substantiate such fears? A detailed, historical investigation of this chilling prophecy is the mission of Nostradamus 2012 an exciting History special that casts the doomsday warning in a frighteningly modern context. December 21, 2012 is bearing down on us with alarming speed. Whether or not we are able to collectively heed the warnings and affect a course to avert disaster may be the defining moment of the modern age. Wasn’t the world supposed to end when we hit the year 2000? I guess that was believed to be more of a man-made catastrophe due to the computer disasters so many anticipated. Well, maybe predictions will come true with the next big “end of days” event in 2012. That’s the subject of a History Channel documentary called Nostradamus: 2012. In it, we get comments from The Divine Matrix author Gregg Braden, Vision for 2012 author John Petersen, Monument to the End of Time co-author Vincent Bridges, Walking in the Fire author Rabbi Ariel Bar Tzadok, Apocalypse 2012 author Lawrence Joseph, Maya Cosmogenesis 2012 author John Major Jenkins, Maya scholar Joseph Jochmans, Nostradamus and the Antichrist author John Hogue, Secrets of Alchemy author Jay Weidner, author/archaic futurist Moira Timms, Zuni Pueblo consultant Clifford Mahooty, and Earth Under Fire author Paul Laviolette. The participants discuss a variety of signs that an apocalypse may come at the end of 2012. Most History Channel documentaries offer a pretty scholarly look at their subjects. Unfortunately, that’s less of a theme here. Instead, 2012 prefers to take something of a tabloid approach to its subject. Admittedly, it’s tough to avoid the sensational side of a topic such as this. We’re firmly into tinfoil hat territory here, so it should come as no surprise that the program highlights the spooky supernatural side of things. I think the show would’ve worked better as part of the Conspiracy? series. Granted, it doesn’t actually cover a conspiracy, but it still fits in that franchise’s concept of investigating controversial concepts. 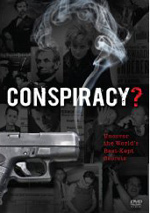 Unlike Conspiracy?, however, 2012 doesn’t provide a balanced view of the topic. It seems to take the mystical claims on face value and doesn’t get into alternate, skeptical perspectives. We get inundated with the idea that Nostradamus was a super-psychic and don’t hear anything to contradict this idea. Not that the program clearly claims the world will come to an end in late 2012, but it sticks almost exclusively with thoughts that fit this theme. Most of these revolve around the impact of a “galactic alignment”, and the show digs into all the ways that climate change connects to apocalyptic predictions. Oddly, 2012 strongly wants us to buy global warming as part of the astrological shifts and the prophecy. At no point does anyone suggest that climate change results from man-made actions and not galactic issues. Seriously? Global warming is all due to the sun’s position and not because of all the things humans have done? A lot of people would love to believe that, and heck, maybe it’s true. However, it seems nutty that the program doesn’t even pay lip service to anything that fails to support ancient mystical interpretations. We also don’t get much to tell us why we should give a hoot about Nostradamus’s prediction. 2012 claims that many of his notions came true but it doesn’t cite any of these. If he really was such a brilliant mind, it’d be nice to hear evidence of this. As displayed here, his prophecies tend to be as vague and open to interpretation as the daily astrology charts; we can easily interpret his writings in various ways that we’d like. I’m a little depressed that the History Channel provides a show heavy on sensationalism and light on critical introspection. 2012 throws out some interesting ideas but it fails to subject them to any form of scrutiny. It’s too one-sided and silly to succeed. Nostradamus: 2012 appears in an aspect ratio of approximately 1.78:1 on this single-sided, single-layered DVD; the image has NOT been enhanced for 16X9 televisions. This was a consistently mediocre presentation. Sharpness varied. Interview shots were reasonably accurate, but other elements tended to be softer and fuzzier. Jagged edges were a problem throughout the program, as it often displayed a blocky look. The image yielded some video artifacts as well; these occasionally gave the program a moderately grainy appearance. Colors looked acceptably accurate and realistic, but they suffered from the vaguely drab tone of the program. The hues came across as somewhat flat and lackluster, though they didn’t seem runny and significantly problematic; they just lacked much vibrancy. Black levels appeared similarly bland, and low-light sequences seemed a bit muddy and murky. This was a decidedly unexceptional presentation. Don’t expect much from the Dolby Stereo 2.0 soundtrack of 2012, though it seemed perfectly satisfactory for this kind of project. Actually, the soundfield opened up a bit more than I expected. The series used the various channels to create general ambience much of the time. None of this demonstrated very good localization, but at least the track showed some life. Music offered decent stereo imaging, and the surrounds bolstered the various sequences. Audio quality was decent. Speech sounded natural and concise, without edginess or other issues. Music and effects appeared acceptable, though not particularly dynamic. I thought the track worked well enough for a “C”. In terms of extras, the DVD includes Additional Scenes. These run 15 minutes, 41 seconds and provide notes from Lawrence Joseph, Jay Wiedner, Gregg Braden, Paul Laviolette, Joseph Jochmans, John Petersen, Vincent Bridges, John Hogue and Rabbi Ariel Bar Tzadok. They chat about the Sun/Earth relationship, the Egyptians, the “end of time” and the Mayan calendar, the Hopi, and the Masons. The clips offer more of the same astrological nonsense that fills the main program, so don’t expect anything substantial. I’d settle for an explanation of Braden’s freaky hair helmet. Do people really take the ramblings of a 16th century “seer” seriously? 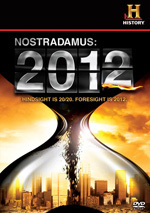 Apparently, as Nostradamus 2012 views its subject without the slightest hint of skepticism or scrutiny. That means it provides some intriguing thoughts but lacks the depth to become anything more than an idle curiosity. The DVD presents mediocre picture and audio along with minor supplements.